1952 - What is it that makes today's homes so different, so appealing? Only in painting, sculpture and (to a lesser extent) music, have the pioneers of the Modern Movement become the establishment in their respective arts. In literature and in architecture the reactionaries who use the techniques of Dickens and put up Shell Centres are still not only in the majority but represent these arts to many people. Thus Alison and Peter Smithson are faced with a multiple problem: not only to overcome the opposition of reactionaries to a previous generation, but also to have ideas accepted which are an extension and development of those of that generation. In the early 1950s a husband and wife architectural team produced a housing project for a bombsite in the city of London. 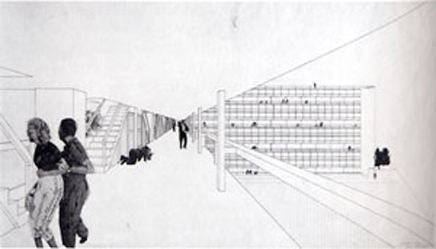 Rather than illustrating their project with isometric drawings, they produced a photomontage--a design of their new building with its internal streets and angular, austere forms--and stuck discrete cut-out figures on them. Some seem to be having gunfights, others are running, all seem possessed by a distinct energy, far from the calm Platonism of the International Style. Among the montaged figures are those of mid-20th Century hypercelebrity. In the foreground Marilyn Monroe and Joe DiMaggio are ducking, huddled as if running from paparazzi. Alison and Peter Smithson's Golden Lane project , polemically debated at CIAM in 1956, can be seen as both a highpoint and repudiation of British Modernism. While it innovates furiously, and participates in debates begun by Le Corbusier's streets in his Unite d'Habitation , it is fundamentally an attack on the purism and anti-urbanism of their predecessors. They would centre on the street, rather than the spaced, radiant zeilenbau or the garden city. This would try and replicate the working class community, not in a static sense, but with a nod towards what Ruth Glass called 'the comradeship of the crowded urban block.' Their development would be dense, it would be urban, and while it would unashamedly house the poor, be part of the new welfare state's safety net, it would be glamorous. In short, it would be Pop. An architectural equivalent to their comrade in the Independent Group Richard Hamilton's montage What is it that makes today's homes so different, so appealing? with its images of consumer technology, Americanism and easy-access eroticism. 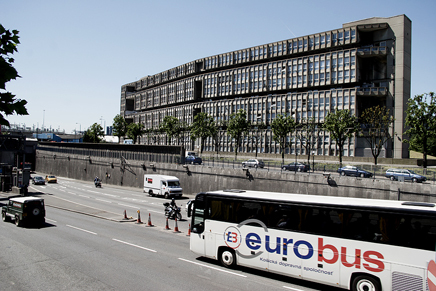 An architecture both of austerity and abundance, in line with the contradictions of the post-1945 melange of Socialism and Capitalism that created the post-war boom, accentuating the most fertile features of both. Alternatively, take the Docklands Light Railway to Blackwall and walk around Robin Hood Gardens, the late 1960s development where the Smithsons finally had free rein to build their streets in the sky. It's undeniably impressive: fortress-like, daringly sculptural, raw concrete gleaming in a manner that could suggest glamour if the setting were not so dispiriting, being so perilously close to the thunderous Blackwall tunnel. Two networks of internal streets and flats, akin in their grandiosity to Vienna's Karl-Marx-Hof , which famously served as a Communist stronghold in the 1934 Austrian Civil War . 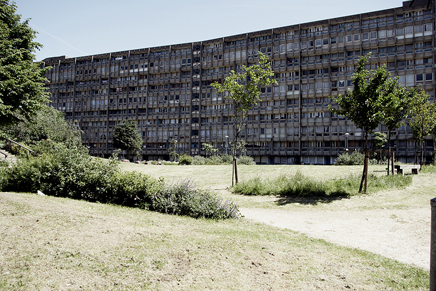 Robin Hood Gardens looks like a stronghold, but one can't imagine anyone defending it right now. In its centre, an artificial hill is topped with burnt furniture. In nearby Bethnal Green are some more successful streets in the sky, Denys Lasdun's Keeling House . Here, the Council, unable to afford its upkeep, sold up to developers, the rich moved in, the rents soared, it became a 'success.' 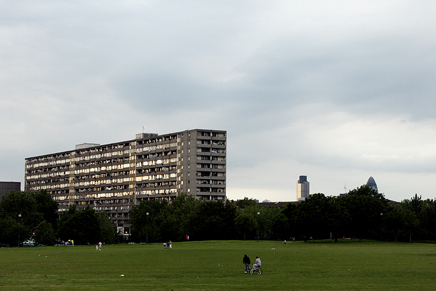 But for now Robin Hood Gardens is still social housing, and as such is an embarrassment. The contradictions from which the Smithsons took their force are absent--the place is still a 'sink estate,' its radicalism a faded reminder of dreams and other futures we could have chosen. Modernism in London, if it starts anywhere (and one could debate whether it has--this is after all a city that for JG Ballard 'went straight from the 19th Century to the 21st, without experiencing the 20th Century in any meaningful way') begins properly with the 1930's work of Berthold Lubetkin and his collective practice Tecton. 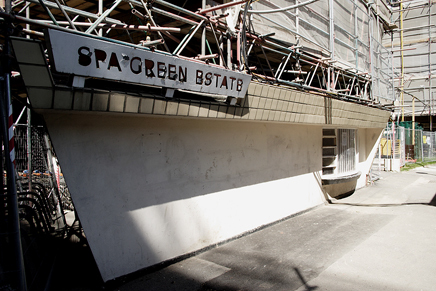 Lubetkin and his comrades were the most pertinent protagonists of the utopian conjunction of municipal socialism and unashamedly avant-garde design. Lubetkin was also extremely straightforward about the social function carried by his forms--he spoke of architecture having to 'march shoulder to shoulder' with the proletariat, of its purpose being the creation of 'eldorado for the working classes.' His claim, justifying the radicalism of the 1938 Finsbury Health Centre , that 'nothing is too good for ordinary people' was virtually taken up as a slogan by the postwar Labour government. So rather than the more famous apartments for intellectuals of Highpoint and the cute curvaceousness of their zoo buildings, it should be in social housing and social provision that their legacy should be sought. The former London borough of Finsbury (now part of the 'creative industries' of Clerkenwell) is full of Tecton's remnants. Once a slum district, the 'Nether World' of novelist George Gissing , it now uneasily holds its past, unsure whether it's a selling point or an embarrassment. Finsbury Health Centre was an intervention, a kind of Anglicised version of an Aalto sanatorium in a tuberculosis-ridden district. Its design, with its combination of unashamed Modernism and nods at the Victorian, would be a huge influence on the post-war Festival of Britain , the Labour government's 1951 architectural showcase on the South Bank of the Thames. This is another point where Britain could have gone in another direction, towards the 'intelligence, order, beauty, mass production' eulogised in the Festival brochure . The Festival was almost entirely demolished when the Conservatives regained power, damned by Churchill as 'three dimensional socialist propaganda' and replaced with the psuedo-Georgian bulk of the Shell Centre . Tecton's Health Centre now is given enough lip service by its new inhabitants to ensure its survival. I recently saw an art exhibition where it had been inexplicably photoshopped into the 'Finsbury Bunny Centre,' with costumed art students bouncing around in its garden. The building looks a little forlorn, but its elegance can still be discerned, telling details like the air vents looking like little Rodchenko sculptures. But the failure of Modernism as a total project can be seen directly opposite--a row of sickly postmodernist cottages, poking grossly at the Health Centre's naÃ¯ve optimism like a stuck out tongue. The area is disfigured by interminable Holiday Inns and Travelodges, by which you can demarcate a route to Priory Green , a large project built immediately after the war. Irony of ironies, the buildings designed by a group which defined homeliness as 'a lack of civic valour' are closed to the public. Fences mark off every individual block so far back that you can barely make out the fine detailing of the entrances, the generosity of space and calm futurism of the slab block design. Signs declare that a coup has taken place: 'Peabody Trust Private Estate. No Through Road.' A squat plastic and pine building marks the way in to the estate, the new owners' respect for their residents reflected in the prominent sign 'NO CASH KEPT HERE AT ANY TIME.' The nearby Spa Green is under scaffolding, perhaps being readied for a similar transformation. This is a setting that deserves to be recognised as one of JG Ballard's Terminal Beaches: the last high-rise council block behind me and an unscripted future ahead, the yellow spiked Teflon tent like a genetically engineered mollusc. In Peckham is the 1933 Pioneer Health Centre , a precursor to Finsbury. Designed by engineer Sir Owen Williams , it is cleanly, classically Modernist--white lines broken by glass curves. It was eulogised in a Penguin paperback, The Peckham Experiment, noting the approach to health as a social problem, pre-empting the idealism of the NHS; though the open plan to enable observation at all points evokes hints of a panopticon, a paternalism that a Marxist like Lubetkin or Ernő Goldfinger might have mocked. The story though is by now familiar--converted into luxury flats, with a 2000's facsimile nearby, pointedly not open to the public. Walk west to Will Alsop's garish 1999 library , which stands as a suggestive alliance between purposeful social Modernist and a less smug than usual PoMo playfulness--and further on to the North Peckham Estate. This is where politicians may turn up and histrionically cry "something must be done!" The original modern buildings here were replaced by more historicist ones after the stabbing of a schoolboy, Damilola Taylor . Though this solution of returning to the styles of the past is one we should reject (especially as the estate retains its fearsome reputation, concrete or no concrete) it nevertheless recognises something key to Modernism--architecture is never neutral. A 2006 Tecton would want to be working in Peckham, if anywhere. The centre of Peckham is London in its purest form--i.e, chaos. A mess of endless cheap chicken joints, gridlocked traffic, decaying victoriana interrupted by surrealistic PoMo tweeness and sheer rotting concrete, an amalgam of nationalities reluctantly tolerating each other, enclaves of the wealthy sitting smugly untouched by endemic gun crime. So we could look for its direct negation, and get the 177 bus and walk from North Greenwich to Millennium Village, built on a former toxic wasteland in the shadow of Richard Rogers' gloriously futile dome . There seem to be less people in a mile here than in an inch of Peckham. And it would be churlish to sneer--these Scandinavian style flatblocks, laid out in desolate space and disused industry, have an eerie charm: unlike the incursions of the Peckham bourgeoisie, here there's no cheap holiday in other people's misery. The Village blocks out London without qualm, and one could almost be persuaded by its retreat. 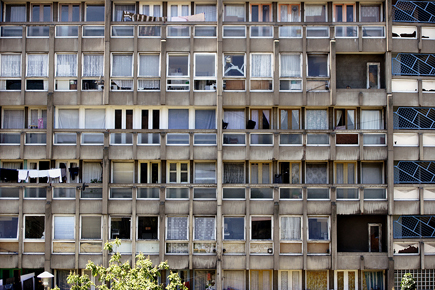 Except of course social housing is meaningless without the social. Architecture is the weakest of the arts, in so far as it is the most dependent on the collective sensibility of the period...if the world would only build temples to machinery in the abstract then everything would be perfect. The only serious collective British Modernism before the International Group of the 1950's was the Vorticist Group of 1910's London, a mutation of Futurism which repudiated the vitalism of fauvism and futurism itself. Vorticist paintings, like those of Wyndham Lewis , Edward Wadsworth and Frederick Etchells , were tight, harsh delineations of tension and force. In one of the last Vorticist exhibitions in 1920, Wadsworth exhibited a speculative sculpture, a plan for a Vorticist building. It was an almost formless but austere concrete fist of a building, with a wrought, tactile surface, impenetrable and alien. No Vorticist building was ever built, though Etchells would design London's first real modernist building in 1930, a functionalist office block in Holborn, while Wells Coates , architect of the Constructivist Isokon flats , was a disciple of Lewis'. But if anything in London evokes Vorticism, it is the vertiginous towers of Hungarian émigré Ernő Goldfinger . 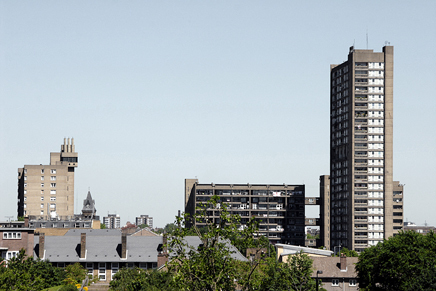 Trellick and Balfron, West and East versions of a similar design based on brute concrete sculpted into tensions and oppositions, heavy and light, as English as 19th Century engineering, as gasometers, factories and war machines. Or you could walk from there to Maxwell Fry and Elizabeth Denby's benign social engineering at Kensal House , built for a gas company--whitewashed concrete curves rehabilitating the density of the slum without the attendant dirt and disease--lightening the effects of industrial capitalism rather than accentuating its forms. Or start somewhere else. A house by Hampstead Heath, lived in by recent emigres from Nazi Germany, an earnest young Hungarian Marxist offending the grosse burgerlich by mocking all their prissiness with clean lines, rationalism, with the whiff of a future in which their privilege will be obsolete. Goldfinger's Willow Road house is, for all that, the acceptable face of Modernism, as with the other prettily alien manifestations of Hampstead functionalism, such as Connell, Ward, and Lucas' De Stijl-esque house on Frognal , or Fry's Corbusian Sun House . Modernism built for solicitors or psychoanalysts rather than standing shoulder to shoulder with the proletariat. Building luxuries rather than necessities, 'the utopia that can be bought,' in T.W. Adorno's phrase. Where I lived was with my dadda and mum in the flats of municipal flatblock 18A, between Kingsley Avenue and Wilsonway. I got to the big main door with no trouble, though I did pass one young malchick sprawling and creeching and moaning in the gutter, all cut about lovely, and saw in the lamplight also streaks of blood here and there like signatures, my brothers, of the night's fillying. The centre and the periphery. The Barbican, on the edge of the Medieval walled city, by the old Cripplegate--and Thamesmead, on the edge of the 19th Century metropolis, a two-hour bus ride from its heart. Here we have two absurdly similar projects. Built in the 60's and 70's, both ran way over budget, both employed a dialectical tension between reinforced concrete and placid artificial lakes, and both are strangely quiet, the tall buildings isolating them from traffic noise. Yet they couldn't be more different. 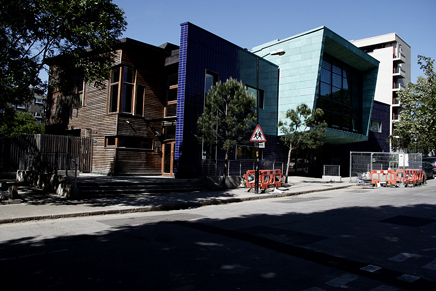 The fierce beauty of one is still used for video shoots to represent urban anomie, such as Chris Cunningham's Aphex Twin video Come to Daddy , with its promised 'cinemas, repertory theatre and ice rink' long since disused, while the other houses stockbrokers and intellectuals, a chattering class arts centre, and an atmosphere of ease and comfort. Round the corner from Golden Lane, where a more sober project that beat the Smithsons' still stands, is one of the most obvious vindications of their theories. 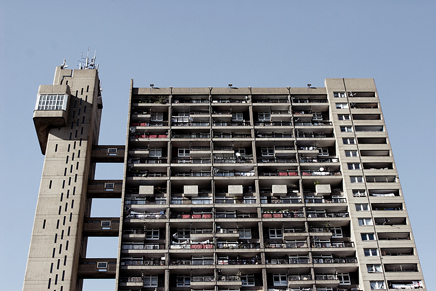 A recent tourist guide describes the Barbican , designed by Chamberlain, Powell and Bon over a nearly 20 year period, as a 'monumental concrete ghetto.' And, if one tries to ignore the wealth of the inhabitants, this is what we have here. Three utterly enormous towers, the largest residential buildings in Europe at the time--curves and spikes, carrying excitement and a hint of fear--and lower but no less fierce blocks curving round some showpiece lakes, linked by a series of seemingly endless (but easy enough to use after a couple of visits) walkways, under and overpasses and Smithsonian streets in the sky. Rather than intimidating and bleak, the Barbican is as attractive and mysterious as a Ballard heroine. This isn't entirely an accident. The Barbican was not built as social housing, and its inhabitants--perhaps the same people who might have lived at Willow Road or the Isokon flats--are comfortable enough to be able to handle a certain degree of the old ultraviolence. More important, in terms of actually vindicating Modernism as creator of socialist spaces, is the relative failure of Thamesmead , a failure that seems somehow more noble than the Barbican's success. This vast estate, almost a self-contained town of 60,000, is most famous as one of Kubrick's locations in the 1972 film of A Clockwork Orange . A signifier of Modernism become perverse and violent, brutalism in the material sense transliterated into physical brutality. The buildings--white-grey concrete point blocks linked by walkways to lakes and futuristic low-rise maisonettes--seem as cold, stylish and psychotic as Alex and his droogs. But over thirty years later, Thamesmead doesn't look violent, just rather melancholy. A 2005 project on Thamesmead by Susanna Round and Rachel Barbaresi shows it becoming successful in the sense that it has inspired a sense of the territorial--the planners' logo is used as graffiti all over the area, while the inhabitants have painted mock-Tudor panels onto the reinforced concrete, the 'sense of identification' spoken of in the original project brief. The lakes and canals, which the brief suggested could mean "one of the pleasures in store for future residents may be Saturday shopping by boat" are full of rare birds, lying still and ready for eventual reclamation of the site. Thamesmead is ringed by Private developments, built in the historical pick-and-mix of the Thatcherite era, which try and abolish history in their determined traditionalism. The original centre though feels like some sort of end point--of London itself, of a brief phase of technocratic rationalism, of the grand public projects of municipal socialism. An end that suggests all manner of alternative beginnings. i found the feature excellent. it was like sobered up delirious new york, condensed on london through social housing. never been there but this is very vivid for me. specially growing up partially, in planned military housing buildings that were almost like 'priory green estate'. i can physically relate. good times and bad times. many cool summer days in dark balconies with solid guard rails. didn't condo/loft conversion cought up in uk? 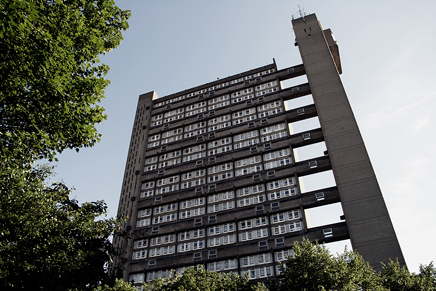 trellick tower would worth a fortune in a us town. great photographs. i wish if some interiors shots of the projects were also available. gunfights in renderings... can you believe it..., today...? the whole piece does a great job on utopian london, modern london and london that jumped the 20 th. century. Can't thank you enough for this exemplary piece, connecting the dots I've gleaned through what is now a quarter-century interest in both London and the modernist future becoming. We linked this---it's really perfect as a web article. Label on picture of the gate lodge building at Priory Green is misleading -- it's not by Lubetkin (of course) but is a new building by some people called avanti architects. I have been working on a project loosely related, focused on Torontoâ€™s significant number of post war suburban high rises. Toronto was highly influenced, directly and otherwise, by the LCC during the 1950â€™s and early 60â€™s. This resulted in a suburban form quite in contrast to the North American norm â€“ towers taking a predominant role. 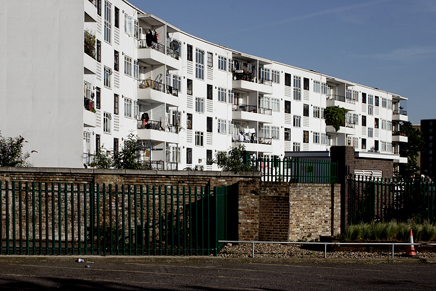 I will be traveling to London in the fall specifically to tour modern housing projects as part of my thesis research. Any further insights you could provide â€“ ie projects of particular interest, would be fantastic. If you have time to correspond about this it would be very much appreciated. you might also look at Vancouver's tower experiance. Quite different from London and Toronto's towers. check out the exhibition catalogue published by the Canadian Centre for Architecture "The 60s: Montreal Thinks Big"